Those of us who have spent years in the trenches helping law departments obtain more value from outside counsel, and helping law firms better profit while delivering more value to their clients, have long lamented the lack of an organized effort to share best practices with others facing the same challenges, particularly with regard to best practices in pricing, project management and process improvement. Our wait is over: the international Legal Marketing Association (LMA) announced the formation of a new "Client Value" Special Interest Group (SIG) with a charter to network, educate and share best practices among law firm, law department and service provider professionals who focus on pricing, project management and process improvement. The SIG is one of several offered by LMA; the others focus on Competitive Intelligence, Small Firm/Solo Marketing, Service Providers, Social Media and Chief Marketing Officers. I've faced these issues from all angles -- in my role leading business development for a global law firm, I was constantly faced with drafting RFPs that were client-focused and priced to win while also maintaining law firm profitability; as a CEO and senior corporate executive, I was regularly battling the in-house legal department for more transparency on budgets and risk management, and hiring outside counsel who took a "you need us more than we need you" approach to client interaction; as an executive with several service providers, I've brought to market products and services designed to help law departments and law firms forge stronger and more collaborative relationships; as a management consultant, writer and frequent keynote speaker, I am constantly addressing audiences of in-house lawyers or private practice lawyers struggling with adapting to the enormous changes taking place in the legal profession. One thread has been constant in every one of these interactions: no one can do it alone! It's critical for clients and providers to get and stay on the same page to ensure that both parties enjoy a mutual and financially lucrative relationship. 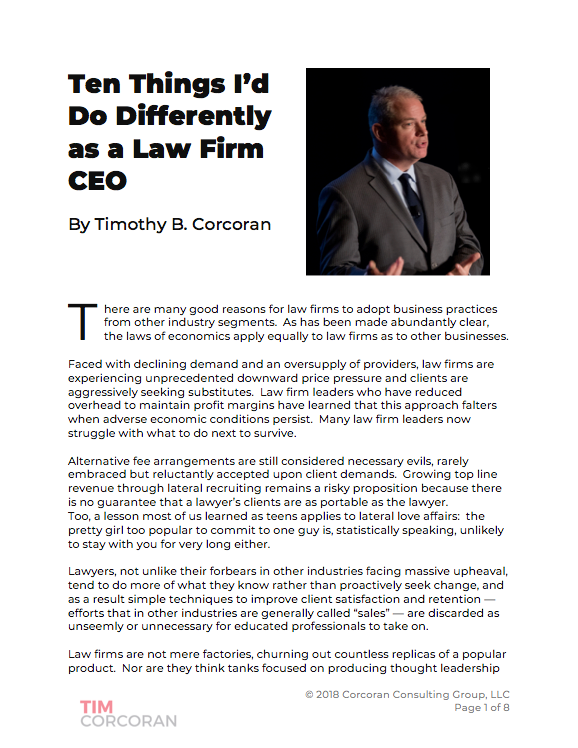 This issue of mutual advantage, in my opinion, has been lacking from many of the existing perspectives: whether it's the standard client panel filled with self-important General Counsel providing endless anecdotes of law firm foibles, while simultaneously ignoring the fact that the their own internal corporate clients are just as unhappy with the law department; or the various caucuses of in-house counsel defining the new normal as "law firms made enough money, now it's our turn" as if their collaboration was somehow an ever-shifting zero-sum game; or law firm leaders who refuse to acknowledge the very real impact of economic forces on their practice; or my fellow consultants who have great depth of expertise to advise either law firms or law departments, but not both -- because they've never worked with "the other side" except in an adversarial capacity. This era is ending. My expectation is that the new SIG will is represent all stakeholders - lawyers from law firms and law departments, of course, but also business professionals managing corporate budgets, e.g., procurement; pricing experts retained by law firms to better link price, cost and value; vendors building tools to analyze and manage complex matters; business development and marketing professionals who are increasingly asked to differentiate law firms on factors such as budget predictability, use of alternative fees and project management rather than just size and practice mix. What these professionals can do together is establish an ongoing dialog, define and improve industry metrics, better define for vendors what to build and why, and provide a roadmap and best practices for those who have been heretofore reluctant to join the fray. Just as other industries have settled on standard technology formats, a common vocabulary, licensing protocols and educational tracks for newcomers, the legal marketplace can greatly benefit from such interaction. (And for the occasional detractor who assumes any interaction between buyers and sellers or among competitors inevitably leads to collusion or anti-trust concerns, I say "You are more than welcome to remain on the sidelines and keep out of our way!" So join me in congratulating the Legal Marketing Association for proactively embracing one of the critical four P's of Marketing (product, place, promotion, price) and launching the new SIG. And join me in thanking the many busy professionals who have, informally and formally, collectively and individually, led these efforts prior to the formation of the SIG, most notably Toby Brown, Director of Pricing & Strategic Analysis at Akin Gump, who will head the new SIG. Also, thanks to Aleisha Gravit, President of LMA, and Betsi Roach, Executive Director of LMA, for making this happen. I look forward to a new chapter in the growing book about the business of law. Full Disclosure: I am a member of the Board of Directors of the Legal Marketing Association and contributed to the effort to form the new SIG.